PEORIA, Ill – Caterpillar’s Cat Payload with production measurement for wheel loaders, excavators, and articulated trucks is integrated from the factory and brings payload weighing to the cab to help operators work more productively and accurately without rework. Operators can track load weights in real time on the in-cab monitor and know precisely how much material is in the bucket or truck. The system uses data from a series of onboard sensors that is processed by the onboard computer to calculate payload weight. 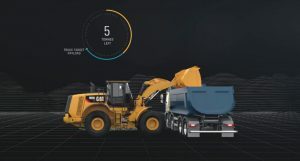 Instant payload feedback through the display gives operators the confidence to work more efficiently and know when loads are filled to target capacity. The truck system also features external payload lights to indicate when the load is full.